John Keats (31 October 1795 – 23 February 1821) was an English poet. He is often ranked as one of the five most important poets of the Romantic movement in English literature; the other four are William Wordsworth, Samuel Taylor Coleridge, Lord Byron, and Percy Bysshe Shelley. 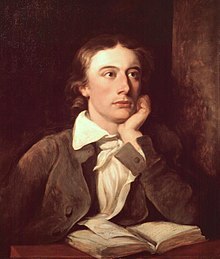 Though Keats was the youngest of these poets, he also died before the others: he suffered from tuberculosis and died in Rome at the age of 25. Keats was the son of an inn-keeper Thomas Keats, who died when Keats was nine years old and Frances Keats; and his mother died of tuberculosis in 1810. The young Keats began studying to be a surgeon, though his interest in literature grew stronger than his interest in medicine. He became a friend and follower of the poet and editor James Henry Leigh Hunt, and made his first attempts to write his own poetry. Keats's active writing life lasted only about six years, from the spring of 1814 through 1819. His short life meant that he wrote less than many other poets. His longest poems, Endymion and Hyperion, tell stories from ancient Greek mythology. Many of his shorter poems are among the best known in English literature, including the ballad "La Belle Dame sans Merci" and his sonnets and odes. Keats was an active letter-writer throughout his life, like many people of his time. Hundreds of his letters to friends and relatives have survived, and Keats is often called one of the great letter writers in the English language. ↑ John Keats at Encylopaedia Britannica. ↑ John Keats at Literary Encyclopaedia. The poetical works of John Keats, edited by William T. Arnold, Kegan Paul, Trench & Co., London 1884. This page was last changed on 8 October 2016, at 05:40.